The one trial that represented a paradigm shift in how heart failure patients will be managed in the future was the COAPT Trial. For years the focus on heart failure has been on the ventricles and secondary mitral regurgitation (MR) has been seen as a symptom of worsening heart failure, with little attention paid to fixing it. COAPT looked at heart failure patients with functional MR and whether using a transcatheter MitraClip repair device would help alleviate symptoms and lower hospital readmissions. The trial results showed the therapy greatly improves patients' heart failure, quality of life and reduced readmissions significantly. Abbott was the study sponsor for COAPT. The 2017 TCT meeting, with its key presentation on the ABSORB III trial showing poorer outcomes vs. the market-leading Xience V metallic drug-eluting stent (DES), was a major blow to the high hope initially pinned on bioresorbable stents (BRS) as a replacement for metallic DES. The data was one of the main reasons Abbott pulled the Absorb stent off the market last year and put its development of the BRS on the back burner. Overnight, enthusiasm for BRS evaporated. This year at TCT, the big stent vendors did not highlight their BRS technology in development, instead refocusing efforts and attention on incremental improvements to their metallic DES platforms. However, a handful of smaller companies did highlight their BRS advancements, most notably Reva Medical and Amaranth. Both vendors highlighted that they now have developed BRS with struts of 85-90 microns, which are on par with the current generation of metallic DES. Experts said one of the big flaws of the Absorb was its 150 micron struts, which made it rigid and difficult to deliver. Early data from both the Reva and Amaranth BRS platforms show promise that this new generation of BRS might be able to deliver better performance in an easier-to-use stent that more closely matches the performance of metallic stents. 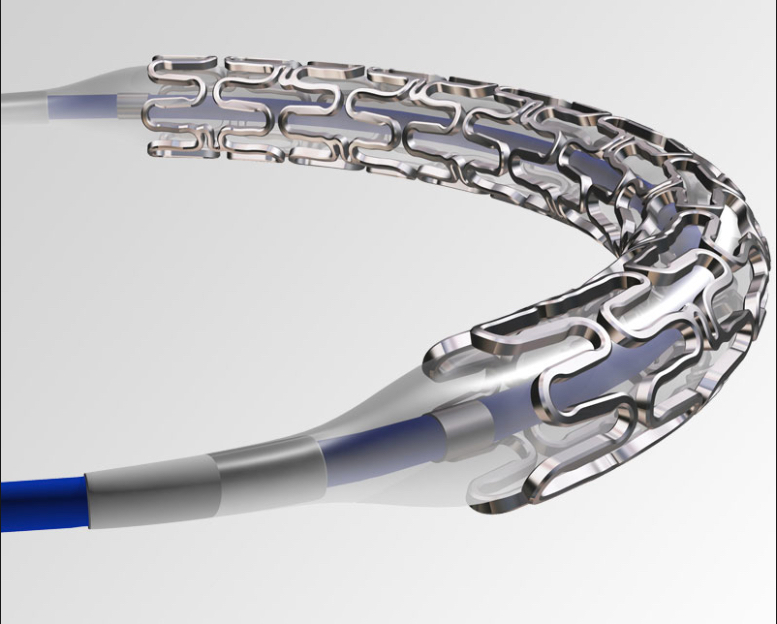 Read the article "The Next Step in Bioresorbable Stent Technologies." VIDEO: The Current State of Bioresorbable Stents in 2018 — Interview with Patrick Serruys, M.D. The late-breaking FAST-FFR Trial examined if fractional flow reserve (FFR) calculations performed using angiographic images alone (FFR-angio) could compare with traditional wire-based FFR measurements. The technology met the study's primary endpoint and exceeded performance goals. 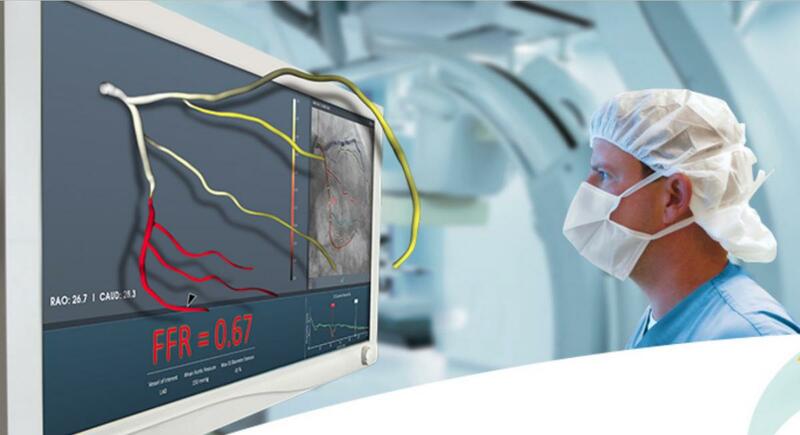 The CathWorks FFR-angio angiography derived technology matched the performance of wire-based FFR measurements, with sensitivity and specificity of 93.5 percent and 91.2 percent, both of which exceeded the trial’s pre-specified performance goals. The diagnostic accuracy was 92 percent overall, and remained high when considering only FFR values in the critical FFR zone between 0.75 and 0.85. As a result, the trial concluded that the CathWorks System has the promise to substantially increase physiologic coronary lesion assessment in the cath lab, potentially leading to improved patient outcomes. William Fearon, M.D., professor of cardiology at Stanford Medical Center in Palo Alto, Calif., was the principal investigator of the trial and lead author. "Based on these findings, FFR-angio has the potential to substantially increase physiologic coronary lesion assessment in the catheterization laboratory," he said. Watch a VIDEO interview with Fearon on this technology. This is one of several FFR-angio technologies in development. Medis displayed its QFR FFR-angio technology on the TCT 2018 expo floor. The company said the technology is pending U.S. Food and Drug Administration (FDA) review. It allows FFR readings with just using a couple angio images a few degrees apart, with contrast, to create a 3-D model of the vessel and color code, showing the drop in hemodynamic flow. The company has validated the technology in more than 1,000 patients and is starting a 2,000-patient outcomes trial comparing FFR to QFR. The Medis technology takes about 4.5 minutes to use, while FFR needs about 7 minutes and requires the use of a pressure wire and adenosine. See an example of the Medis technology in this VIDEO. The biggest stent news from TCT 2018 was the late-breaking Imperial Trial. The 465-patient study compared Boston Scientific's recently FDA-cleared Eluvia drug-eluting, self-expanding peripheral stent with Cook Medical's market-leading Zilver PTX stent. This is the first head-to-head drug-eluting stent trial in the superficial femoral artery (SFA), and Eluvia outperformed the Zilver PTX on all accounts. One of the long awaited trials has been the Lipid Rich Plaque (LRP) study, which over the past six years looked at using near infrared spectroscopy (NIRS) paired with intravascular ultrasound (IVUS) to identify vulnerable plaques and predict if they would develop into heart attack-causing lesions. The answer in this trial was yes. "The aim of the LRP Study was can we use NIRS spectroscopy to identify vulnerable patients and vulnerable plaque," said Ron Waksman, M.D., associate director of the Division of Cardiology at MedStar Heart Institute in Washington, D.C. "This study supports the use of more imaging for the detection of vulnerable plaques in patients who have already come in with an event." A total of 1,563 patients with suspected coronary artery disease who underwent cardiac catheterization with PCI for an index event were enrolled. Imaging by NIRS-IVUS was performed in two or more arteries, and patient-level and plaque-level events were detected for two years. All patients with at least one maximum lipid core burden index (maxLCBI) 4 mm segment greater than or equal to 250, and a randomly selected 50 percent of patients with all maxLCBI 4 mm segments less than 250, were followed. In the vulnerable patient-level analysis, the risk of experiencing non-culprit MACE event within 24 months was 18 percent higher with each 100 unit increase in maxLCBI of 4 mm. Patients with maxLCBI4mm ≥400 had a MACE rate of 12.6 percent compared with 6.3 percent for patients with maxLCBI4mm˂400. In the vulnerable plaque-level analysis, the risk of experiencing an event in a coronary segment within 24 months was 45 percent higher with each 100 unit increase in maxLCBI 4 mm. Plaque with maxLCBI 4 mm ≥400 had a MACE rate of 3.7 percent compared to 0.8 percent for plaque with maxLCBI 4 mm˂400. When the LRP trial was originally announced, some of the experts involved said NIRS might be used to detect vulnerable plaques to pre-emptively stent the lesion before it ruptured. However, that line of thinking has been rolled back in the current era of looking for ways to reduce the number of stents implanted. Waksman said detection of problematic plaques can instead be a way to proactively place patients on new pharmacological therapies to treat the lesions and avoid the need for stenting. Watch a VIDEO interview with Waksman in this trial. Read more details on the LRP trial. In the first randomized trial of an Indian-made stent versus the best-in-class Abbott Xience conducted in Europe, the SMT Supraflex sirolimus-eluting stent performed very well in the late-breaking TALENT trial. The rate of a device-oriented composite endpoint of cardiac death, target-vessel myocardial infarction and clinically indicated target lesion revascularization (TLR) at 12 months was 4.9 percent with Supraflex and 5.3 percent with Xience. There were no significant differences between groups for any of the components of the composite outcome, but a per-protocol analysis suggested that TLR might be lower with Supraflex. The trial is significant because India is on track to become the second largest consumer of coronary stents in the coming years. The government placed a price cap on stents to keep them affordable, which opened the door to less expensive Indian-made devices. But there has been pressure to test these stents against U.S.-made stents, which are perceived to be better quality. This trial showed homegrown Indian stents could hold their own against the top U.S.-made stent. The Superflex is available in Europe, but not in the U.S.
Other presentations at TCT 2018 by Indian interventional companies such as SMT and Meril Life Sciences, which included big endorsements from several TCT directors and co-directors, indicate there will be many more Indian interventional device technologies discussed at TCT and other meetings in the coming years. This includes stents and numerous structural heart and transcatheter valve technologies as the Indian biotech industry moves to the world stage. Read more about the TALENT study. The SOLVE-TAVI trial was the first randomized study to compare general versus local anesthesia during transcatheter aortic valve replacement (TAVR) in patients with intermediate to high surgical risk, and found local anesthesia to be both safe and effective. In addition, the study found that a current-generation balloon-expandable valve had similar outcomes to a current-generation self-expanding one. TAVR is increasingly being performed in symptomatic patients with severe aortic stenosis at high to intermediate surgical risk. Based on registry data, approximately half of the procedures are performed with general anesthesia and the other half with local anesthesia with possible conscious sedation. The registry data also suggests lower mortality, lower morbidity, shorter intensive care unit (ICU) and hospital stay, and shorter procedure times with local anesthesia. However, there is a lack of adequately powered randomized trials comparing the two types of anesthesia in TAVR. In this randomized, prospective, multicenter trial, 447 patients with severe symptomatic aortic stenosis and intermediate to high surgical risk were randomized in a 2 by 2 factorial design. Patients were randomized to either general or local anesthesia with conscious sedation, and also to the balloon-expandable Sapien 3 valve or the self-expanding CoreValve Evolut R.
The primary endpoint for the valve strategy was all-cause mortality, stroke, moderate or severe prosthetic valve regurgitation, and permanent pacemaker implantation at 30 days. The endpoint occurred in 27.2 percent of the Evolut R group compared to 26.1 percent of the Sapien 3 group. The rate of relevant valve regurgitation and permanent pacemaker rates were similar with both devices, but there was a higher rate of stroke with the balloon-expandable valve. Read more on the SOLVE-TAVI study. A high number of patients in a study who underwent TAVR experienced severe and moderate cases of prosthesis-patient mismatch (PPM), meaning the implanted heart valve is too small for the patient, which can lead to inadequate blood flow. The research team from Penn Medicine also found that the risk of death and of heart failure readmissions were 19 percent and 12 percent higher, respectively, after one year as compared to patients without severe PPM. Of the 62,125 patients who received TAVR in the United States between 2014 and 2017 and who were evaluated, researchers found 12 percent experienced severe PPM, while 25 percent had moderate PPM. Read more details on this study. VIDEO: The Importance of Ventricular Unloading in AMI and Cardiogenic Shock — Interview with Nevin Kapur, M.D. VIDEO: How to Achieve Hemostasis With Large Bore Device Access — Interview with Philippe Genereux, M.D. VIDEO: How to Reduce Cardiogenic Shock Mortality by 50 Percent — Interview with Babar Basir, D.O., and William O'Neill, M.D. VIDEO: Differences in Cardiac Complications and Presentation Between Men and Women — Interview with Cindy Grines, M.D.